Did you know a potential customer researches and reads between 3 to 5 different types of content about your business before reaching out to you? That’s five different opportunities to convince readers they need your product or service – content creation and marketing can help small businesses land those important customers. However, if you’re reading this and thinking ‘but writing terrifies me’ then as someone who writes for my bread and vegemite, here are three tips I use to make my clients sound better on paper and online. Hint: You can use also this checklist to check your webpages, landing pages or even social media copy. Who is your ideal customer? What do they like, dislike, where do they like going on holidays, how old are they, and how do they talk? These are only some of the questions you need to answer. The answer isn’t everyone between the ages of 18-60! You must have a profile of your customer as part of your business plan. If not, grab a piece of paper and a pen and write a detailed customer avatar (a fancy name for an ideal customer profile). Then brainstorm ideas for content they’ll like. For example, if they like to take frequent holidays, they’ll be interested in a post on 5 things they need to know about their next trip. Creating content without knowing who you’re talking to or trying to appeal to everyone connects with no one. Imagine if you walked into an Apple store with devices laid out everywhere. Employees are telling you everything about all the devices. You tell them you want an iPhone not an iPad but no one is listening. Translate this to the online world – what does your reader or potential client do? They hit the back key on their browser! 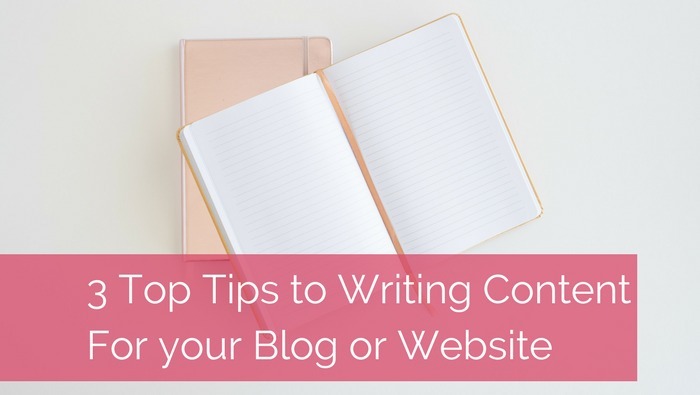 Blog posts are a sneaky culprit with the writer indulging in endless waffling, without any order, which quickly loses readers. A blog post must have an introduction, main body (with subheadings) and a conclusion. Add keywords that customers might be searching. Include a call to action (CTA) at the end – ask them to sign up to your newsletter, call you for a quote or share on social media. Avoid waffling, be warm and friendly but get straight into it. Optimise the blog for SEO with a few well-chosen keywords; write enticing page titles, descriptions, and include a CTA. Never send your first draft out into the Internet jungle (I rewrote this post four times). Refine your words and cut out jargon. 3. What’s in it for your customer? You might have the best product in the world but how will it make your customer’s life better? Will it save money, make him or her healthier or secure about their future? Your content needs to spell out clearly how your product or service will benefit your customer – always ask what’s in it for them. Let’s say you own a cake business and thinking of introducing a same day order-and-delivery service. Feature: We offer same day delivery for birthday cakes. Benefit: Our same day order-and-delivery cake service means there’s always a cake ready for those special occasions (even if you remembered it on that morning). With 59.3 million posts published monthly on the web, you need great ideas and more importantly, outstanding content in different formats to make a great first impression on new and current customers. Do you hate writing? Email me to ask how I can write clever and creative content for your business. Find out more about Rashida and her services here .